Recently I posted about the century oak that fell during a late spring storm this year. 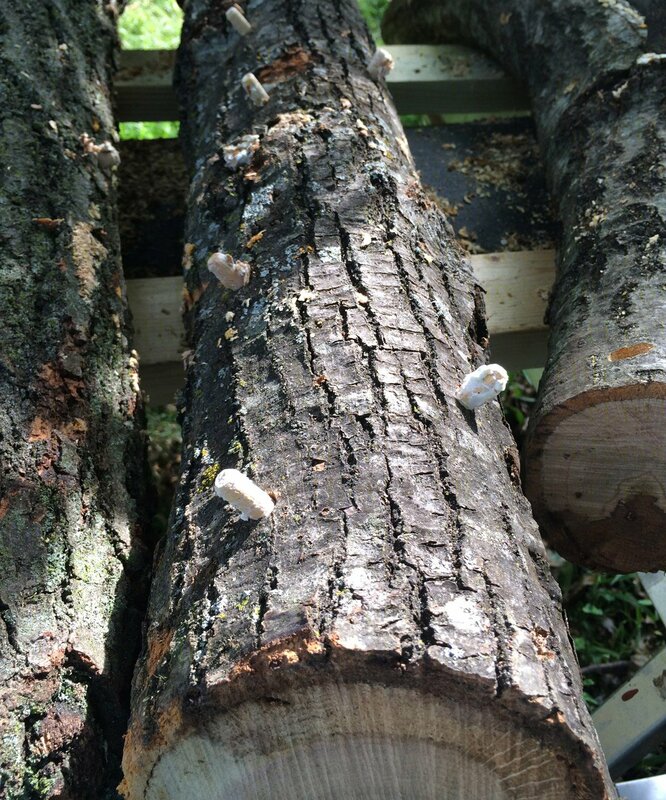 I’m still kind of grieving the loss of my favorite tree, but the wood my tree trimmers saved me has fueled a couple fun projects – including building a log pile in the woods inoculated with several types of edible mushrooms. 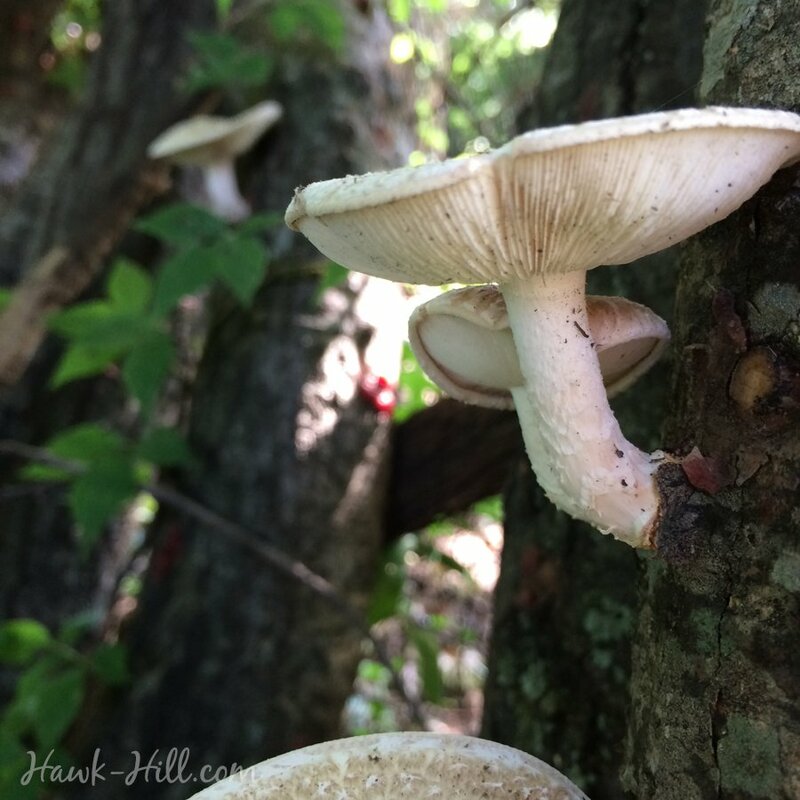 Although growing edible mushrooms is growing increasingly common, I found an incredible amount of conflicting information when researching how to inoculate my logs. Some instructions said mushroom logs should be 2-3 feet, while others suggested 5 feet. 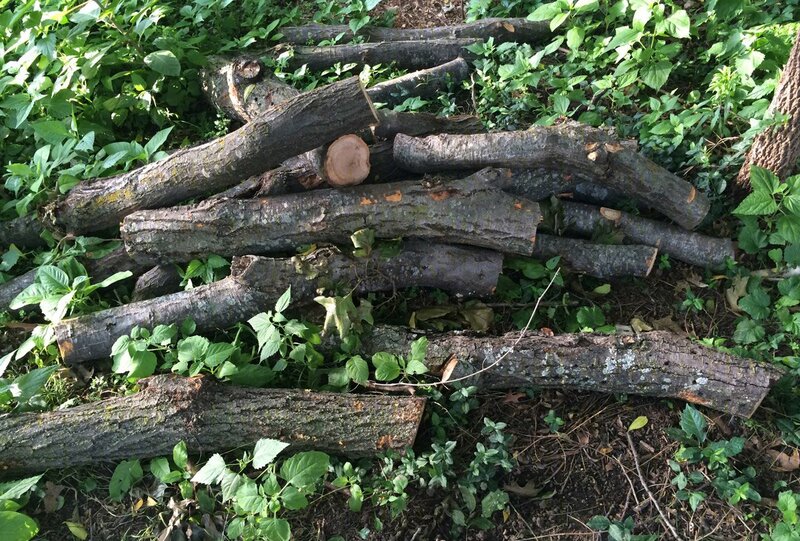 Some sites indicated the logs should be cut within the same week of inoculation, while others indicated that you should wait at least a month or more to allow natural anti fugal properties of live logs to dissipate. Some instructions indicated that the logs should be watered regularly, while other sites instructed the logs would only need watered if exposed to drought conditions. 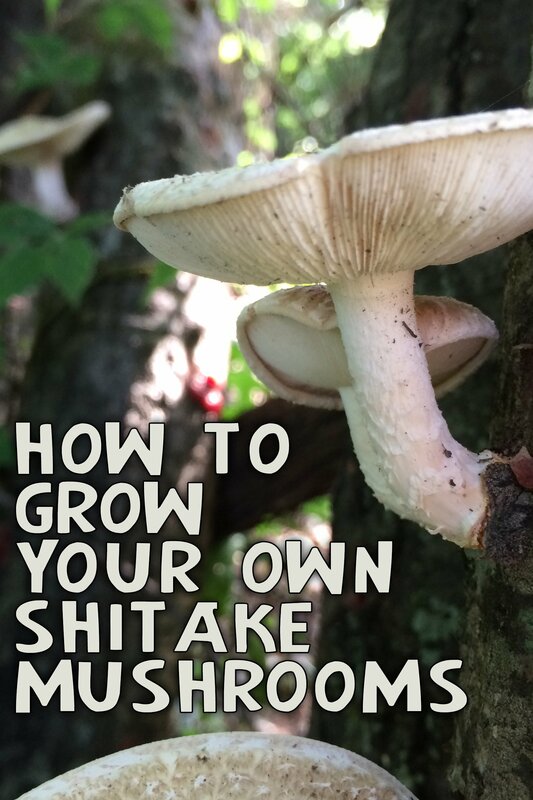 On top of this information, I found that live mushroom plugs varied in cost by a huge margin, and I ended up spending the better part of an entire afternoon reading up and comparing prices and comparing notes on different growing methods. I hesitate to call the instructions below a tutorial, as I am definitely no expert, but feel reasonably well informed after reading many articles on the topic. 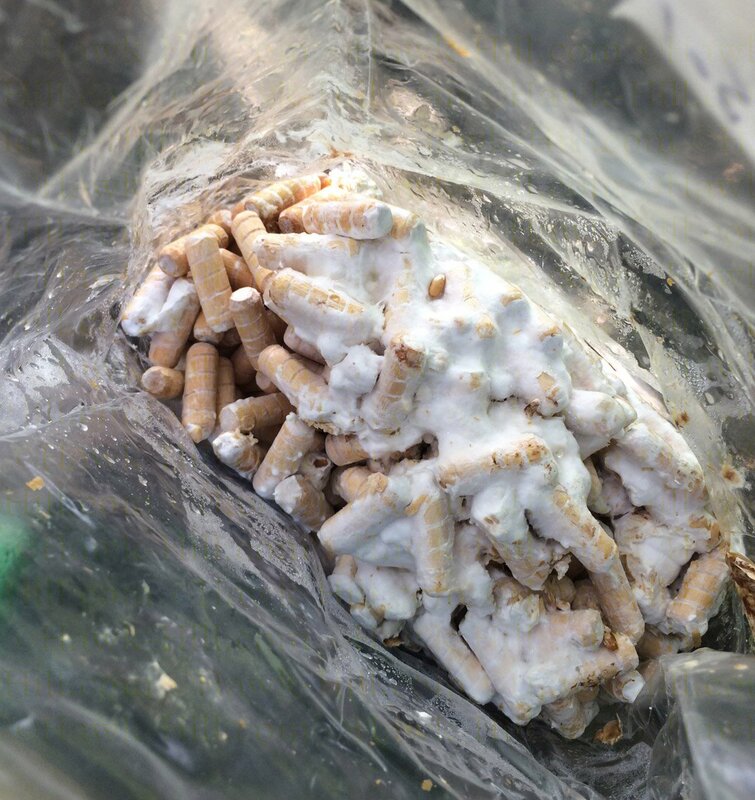 Mushroom spawn plugs come sealed in a bag with a fungus growing over the bits of grooved dowel rods. This shitake was white fungus, but the varieties I ordered varied in color. 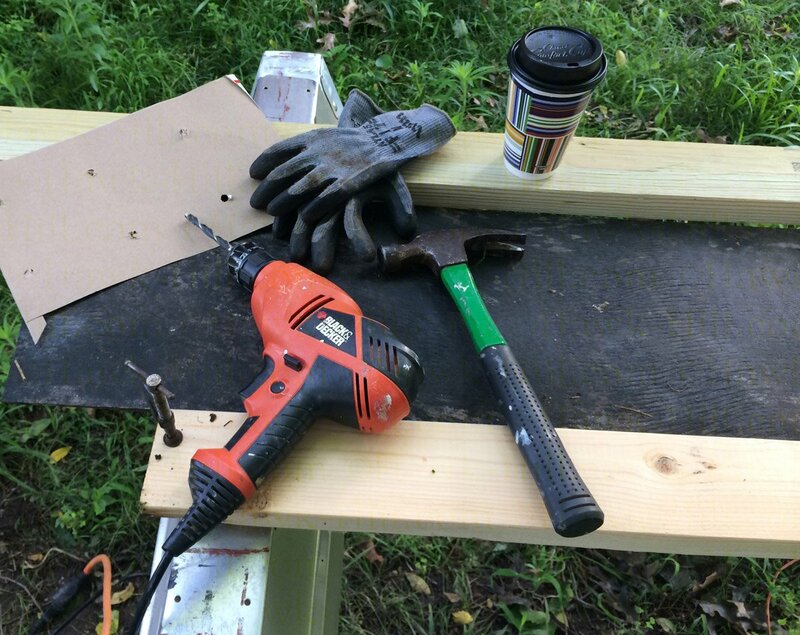 The process sounded simple enough: drill holes in logs, insert bits of dowel that contain live mushroom spores, and seal hole. In practice, it WAS simple, but was also pretty time consuming and harder work than anticipated. 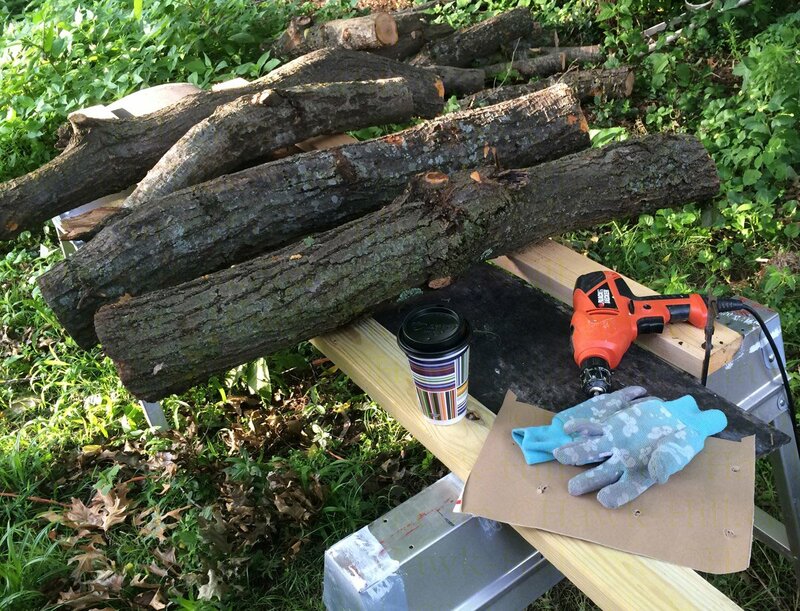 Since high temperatures that week were in the 90’s, I got up early and worked on my logs in the morning. It actually took 3 mornings, working about 3 hours each morning, to inoculate 12 logs and 3 stumps. Wax was the only unusual supply needed for this project other than the mushroom spawn itself. Although I knew I could probably find a cheaper alternative, I did end up ordering the cheese wax sold by and recommended on the mushroom shops online, just to simplify the process. 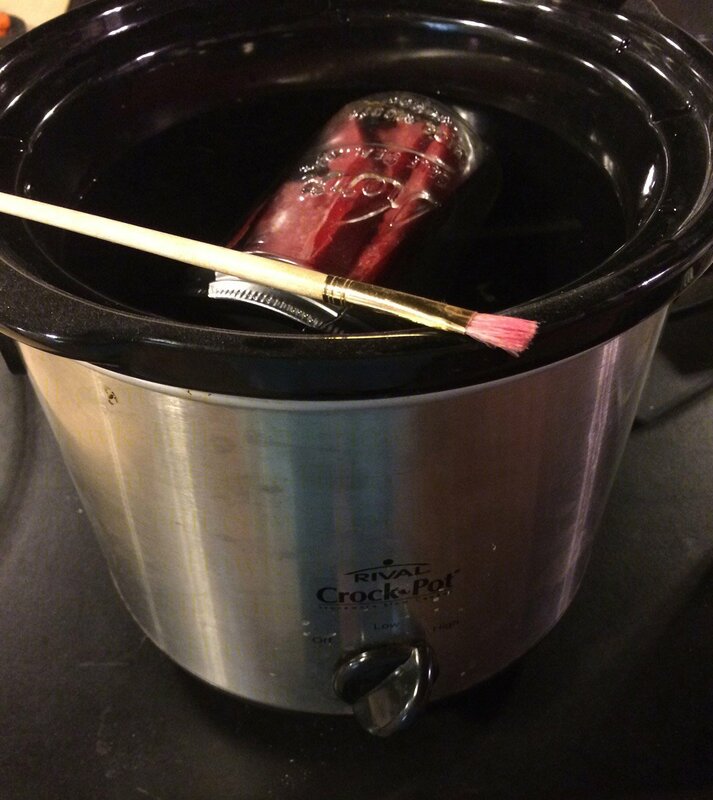 To melt cleanly, I placed chunks of wax in a mason jar, sealed it, and set it in a crock pot set on high to melt. A mason jar and a crock pot make an easy-clean-up way to melt wax. My pile of oak logs varied greatly in size and shape.I’m interested to see which colonize the fastest and/or product the most heavily. 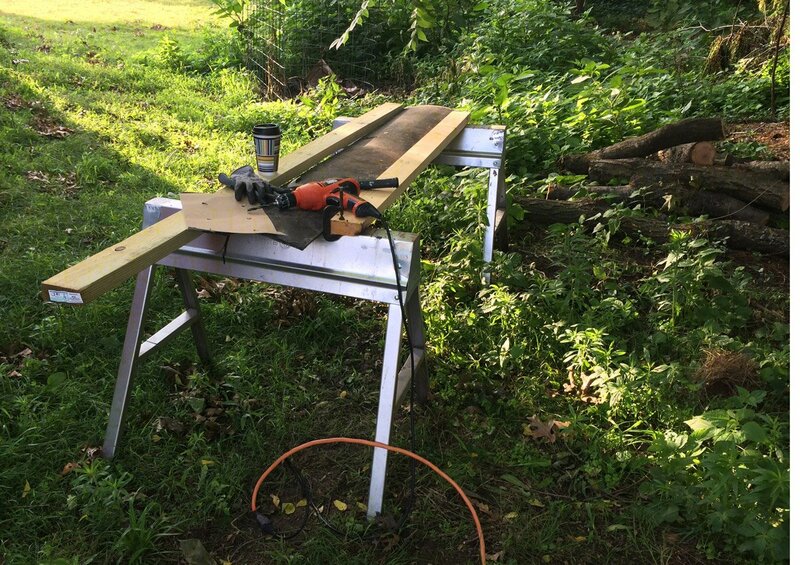 First I drilled holes in a log. Initially I made a pattern to use to create the 4 inch grid recommended by the mushroom websites, although I very quickly switched to just eyeballing it- which sped the process up a lot. Then using my fingers I inserted a dowel (i.e. plug spawn) into each hole. I found it easiest to hand-insert many at a time, then go back over the area with my hammer. 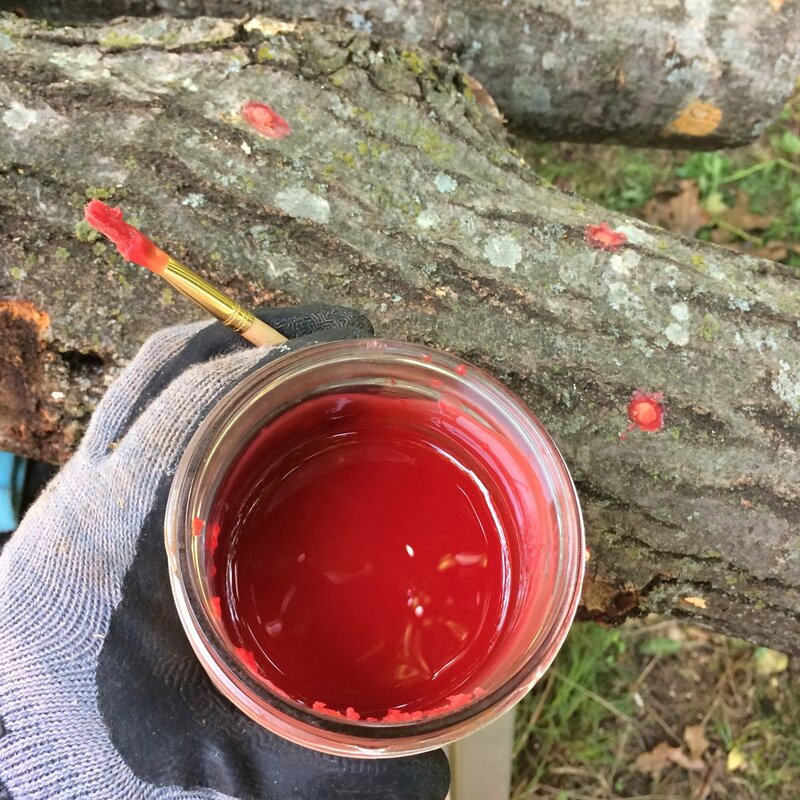 Once I finished inserting plug span into a batch of logs I’d go in and get my mason jar of melted wax and an old paintbrush and liberally coat the top of each plug with cheese wax. The wax keeps the plug from drying out, while also keeping insects out. 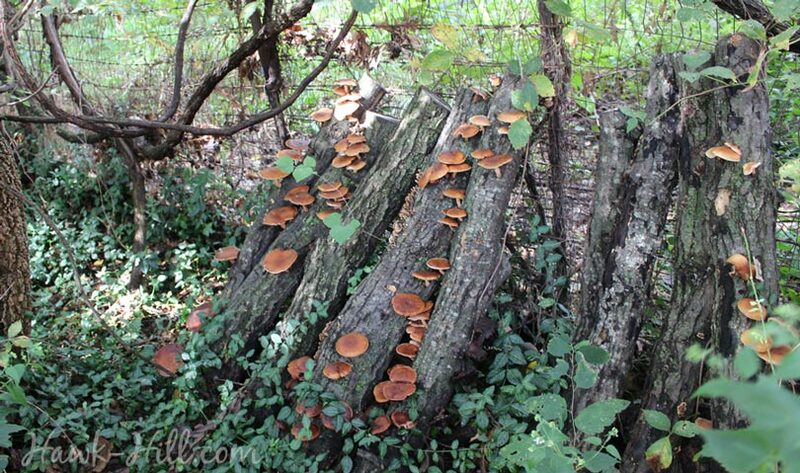 After all my logs were finished, I stacked them against an old fence in the wooded section of my property. Here, they’ll get about 1 hour of mottled sunshine a day and be in the shade most of the time- plus I can easily keep an eye on them from the chicken coop, so I can spot growth when they decide to spring into action! What’s your favorite type of mushroom? I planted lots of shiitake plugs because they are my favorite, but also planted oyster mushrooms and chicken of the woods for variety and, hopefully, to be able to harvest at different times. I also inoculated a few logs with Reishi mushrooms. though not edible, studies have shown them powerfully effective at battling tumors.. and if I can grow anti-tumor mushrooms in my backyard, I think I should. 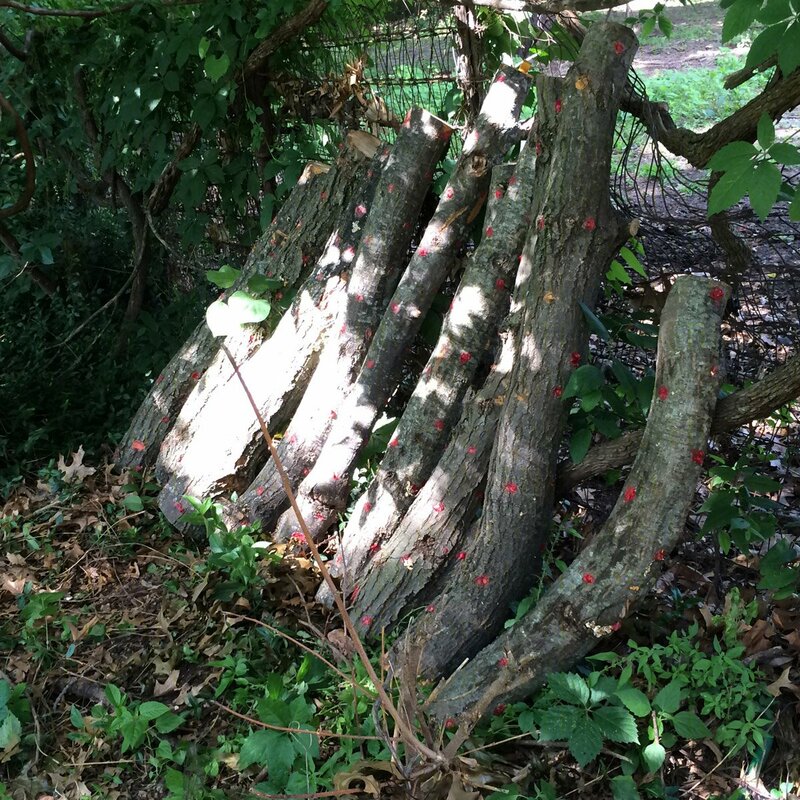 It’s been 18 months since I inoculated these inconspicuous logs with mushroom spawn and I’ve been please with the results. 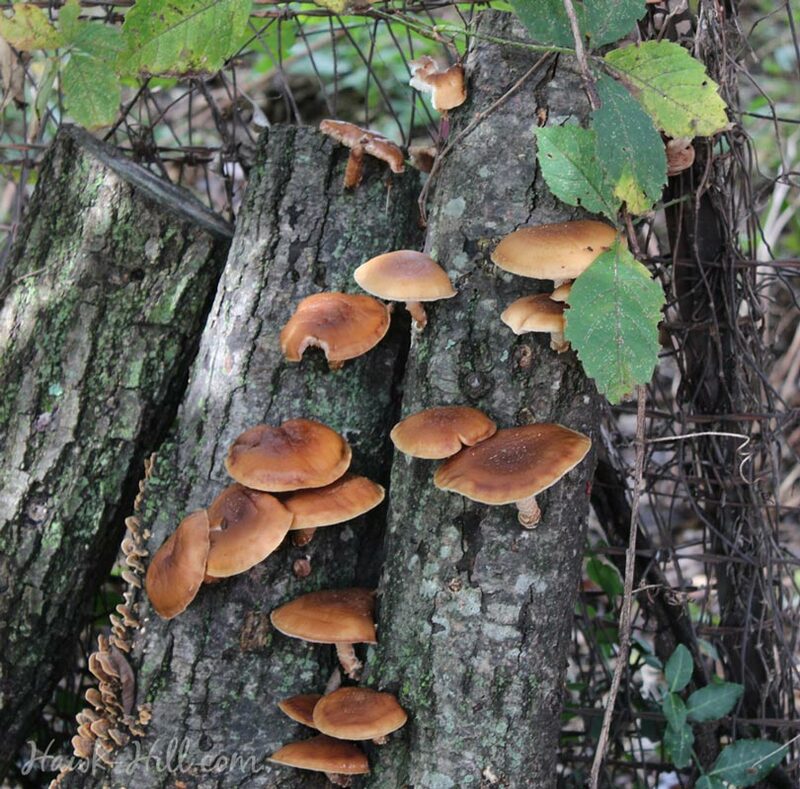 About 12-14 months after first treating the logs, I began to harvest blooms of Shiitake. 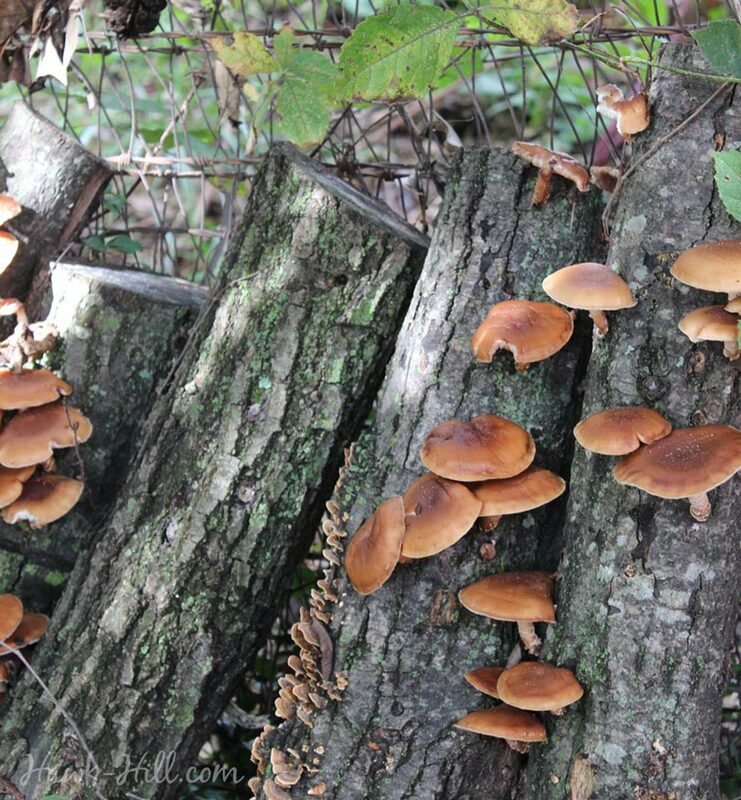 The other mushroom varieties have been less active, but do show signs of colonization. 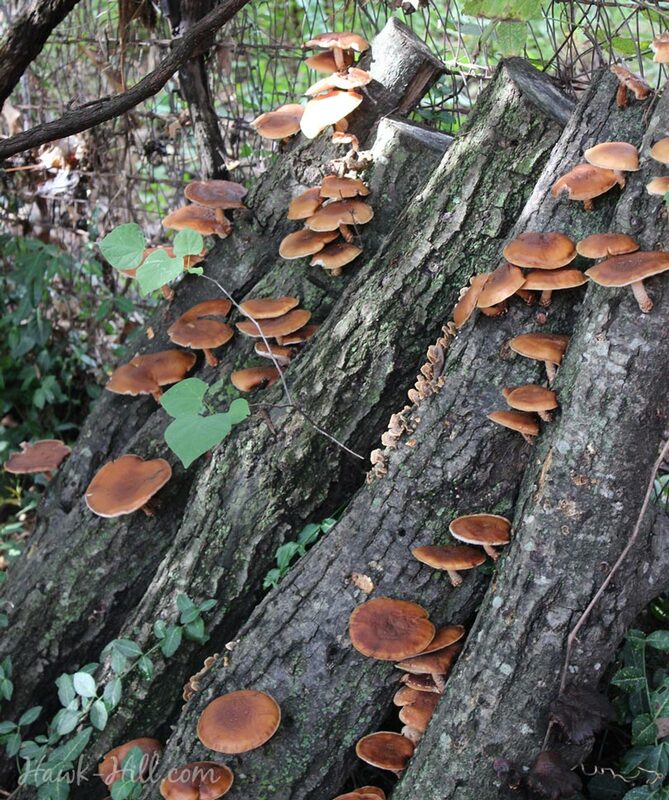 16 months after inoculating these logs, I came back to Hawk Hill from Washington to find this scene: every single Shiitake-inoculated log laden with a thick bloom of edible fungus. As you can see, the alternate mushrooms types I planted (oyster mushrooms & “chicken of the woods”) remain unfruitful so far. 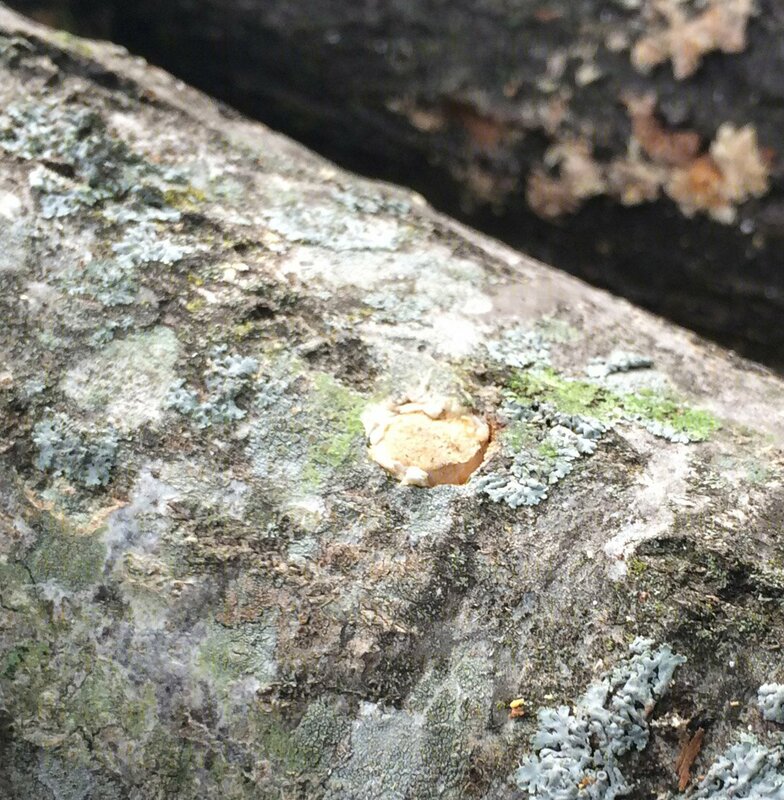 Also surprising: native fungus competing for territory on one of the logs. I probably should have pulled that log from the pile but the fall 2016 trip back to Hawk Hill was a final trip, gathering personal items for the last time before the contents were auctioned and property sold to make room for my new adventure in Washington, where my life is my bigger, but my living space much, much, much smaller. Thank you for this article! I’ve been wanting to start a mushroom garden and we just had a dead tree come down in the yard that I thought would be perfect. 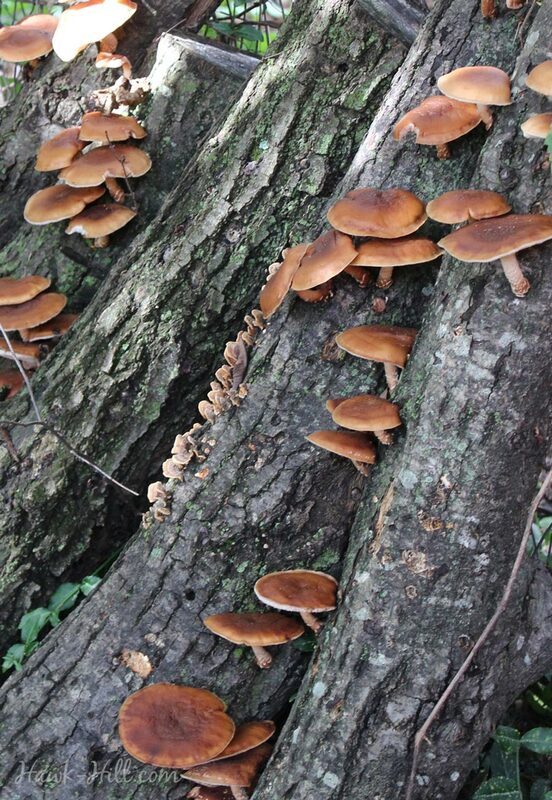 One issue — upon inspection, I found the tree was killed by termites — do you think that is reason not to use it for a mushroom garden? 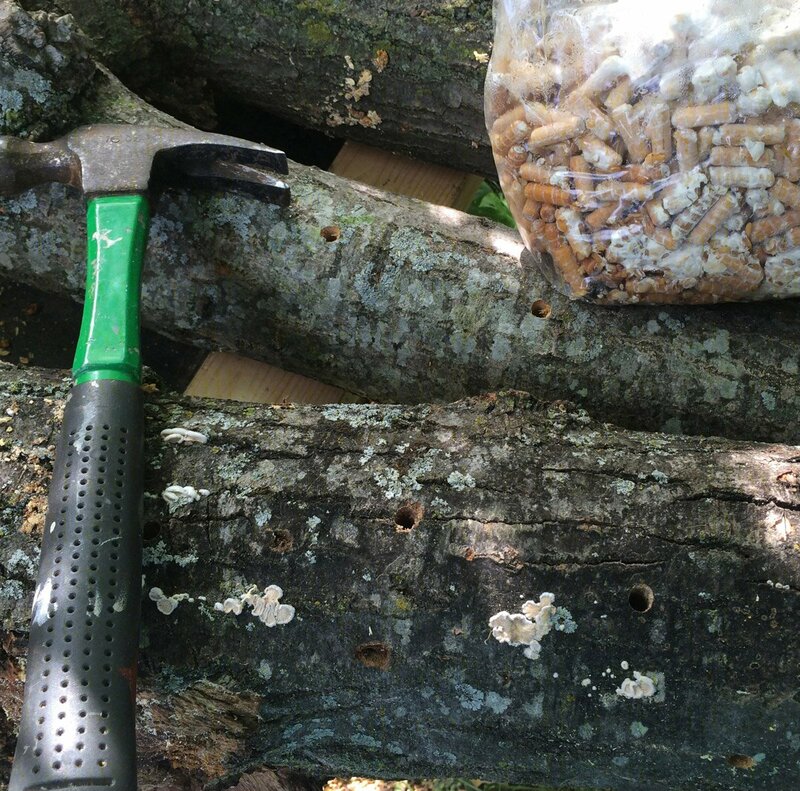 My understanding is that termite colonies live deep underground, so I will be looking for a non-toxic way to address the source so as to prevent them from moving to any other trees in the area. But meanwhile, would I be better off getting rid of the fallen tree rather than using it? 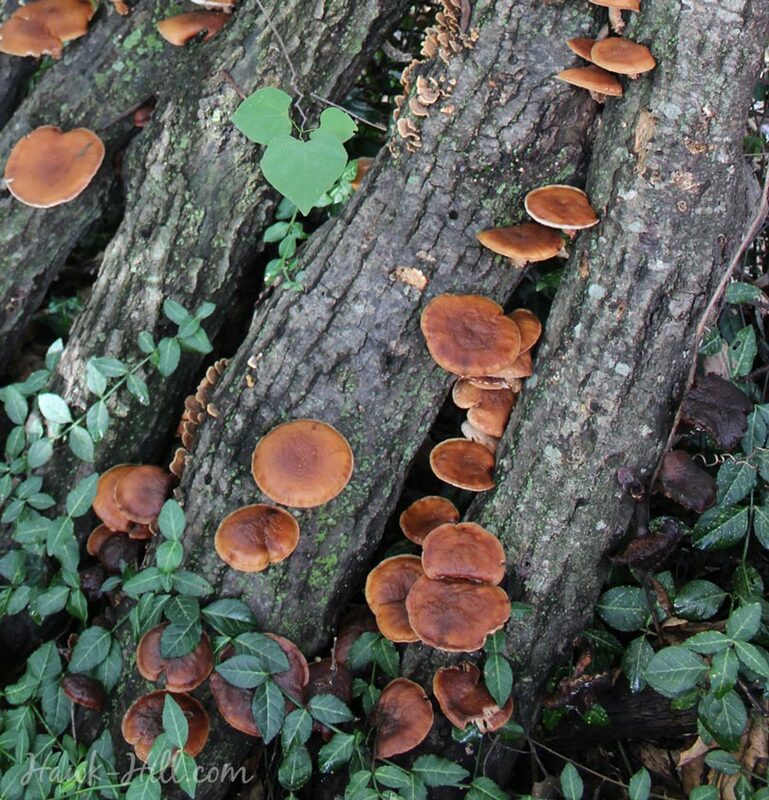 Or would using it for mushrooms be a nice way to make lemonade from the lemons/termites? Thanks for your thoughts!